Let’s take a look at some of the best examples of healthcare content marketing out there. Nuffield Health’s content efforts are definitely some of the best in the industry from what I’ve seen, all underpinned by its ‘small victory’ slogan. This first clip is a perfect example of how really good content doesn’t need to be a sales pitch. The clip is not about Nuffield at all. But it motivates people to get up and get fit, with the Nuffield branding only appearing at the end. We often talk about the importance of storytelling in content marketing, and the video below is a perfect example of this. It tells an uplifting story while relating it back to Nuffield Health’s services and its ‘small victory’ campaign. Nuffield Health also makes great use of Vine, with lots of bite-sized health tips. The animation below is all about staying hydrated. I really like this one, too. You click pause on the Vine and it gives you a ‘small victory’ to take on. On Twitter, Nuffield shares some really nice blog content, such as this piece below about a 7/7 survivor using mindfulness to get through it. Again this is a fantastic example of storytelling as a content marketing tool. Bupa has had some real success with its video content. This short animation about the tooth fairy has been viewed well over 1m times since it was published last year. But my favourite video content from Bupa has to be its ’10 Glorious Seconds’ short film. Production of the film was paid for by Bupa and filmed in one of its care homes. The film is the perfect piece of content because it has a massive emotional impact but also paints Bupa as compassionate and empathetic when it comes to elderly care. Plus it’s just a really nice little story. The clip below is just a preview, but you can view the whole film on the 10 Glorious Seconds website. Johnson & Johnson has gone heavy with the emotional content on its YouTube channel, which is always going to resonate with people. The clip below follows three dads and the impact they’re having on their kids’ lives. It’s linked to Johnson & Johnson #seehowloveworks campaign, which it says is designed to show the world what inspires it to care. Sounds painfully cheesy, but with nearly 1m views on this video alone the campaign is obviously doing something right. 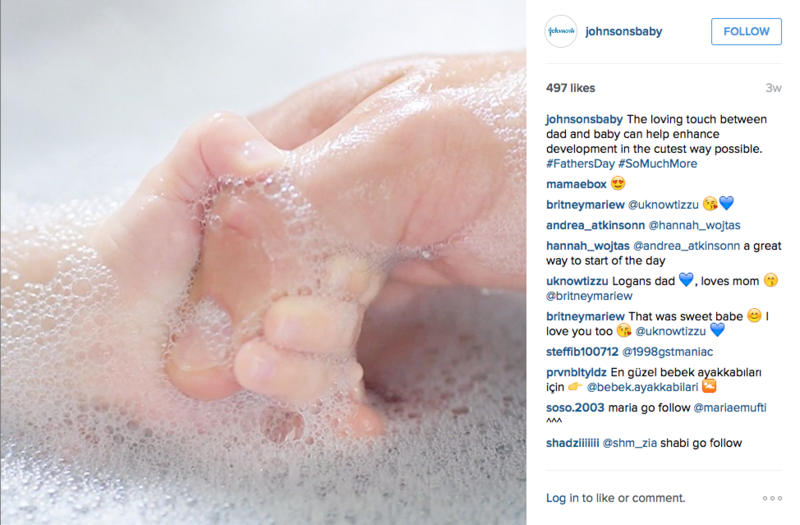 Johnson & Johnson has some nice Instagram content, too. On its Johnson’s Baby page it made effective use of emotional content in the run-up to Father’s Day, like this quote from a doting dad on Twitter. J&J also puts some decent content out on Twitter, like this quote from its Chief Scientific Officer Paul Stoffels about the fight to rid the world of HIV. This type of content is effective because it is based on topics a lot of people care about across the world and it positions Johnson & Johnson as trusted experts in the field. CVS Health is the biggest healthcare company turnover-wise in the US, and number 10 on the Fortune 500, so you would expect this organisation to be creating some pretty decent marketing material. One thing I like on CVS’s YouTube channel is these really simple 30-second clips. They may be a little bit on the self-promoting side, but they do look pretty good. CVS also ran an anti-smoking campaign, #OneGoodReason, after it stopped selling tobacco in its pharmacies (they used to sell tobacco in pharmacies?). To support the campaign it produced a number of videos, all of which went into six figures on views. One thing the NHS does really well is rank for search queries relating to symptoms or treatments or anything that people are likely to Google when they’re worried about being ill. It does this by having a comprehensive bank of content on its NHS Choices site relating to almost any ailment you can think of. It links to these articles through its social accounts, too. People’s health is always going to be an emotional subject. Healthcare companies need to tap into those emotions with their content, but not gratuitously. With some of the content I came across there was a danger that the companies in question were almost exploiting those emotions in people, whereas the content should be more about helping people get through their problems. Nuffield Health and Bupa are my favourites on this list, because I feel like they managed to strike a good balance between playing to people’s emotions but also giving them genuinely useful content.